Almost everyone involved in health care will tell you that the greatest problem in our system is that we pay on a fee-for-service basis. Almost everyone is wrong. The logic is obvious – paying a fee for a service encourages providers to get more fees by providing more services. Ergo, we consume too much and spend too much. Ipso facto, getting rid of fee-for-service would result in fewer services and less spending. Case closed. In fact, almost everything we do in the course of our economic lives, we do on a fee-for-service basis. When we go to the movies, get our oil changed, have our roof replaced, buy a computer, get a haircut, hire a baby sitter, buy a steak dinner, get someone to do our taxes or defend us in a suit, we do it on a fee-for-service basis. None of it is particularly inflationary. 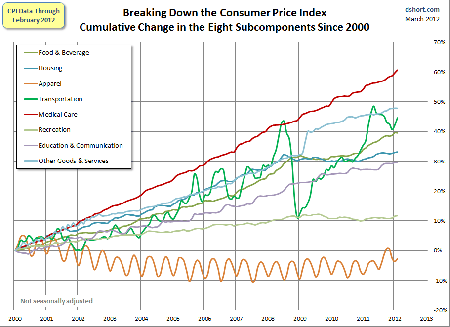 The graph below shows the CPI broken into components. Food, housing transportation, apparel – all are paid fee-for-service and all have a lower rate of inflation than health care. Yes, the providers of these services would like to sell us more units of service. But we have good reason to resist – we don’t want to waste our money on services we don’t need. What is unique about health care is not fee-for-service, but third-party payment. Only in health care is there someone else picking up the tab for our spending. If we applied the same third-party payment technique to any other segment of the economy we would get the exact same inflationary spiral we see in health care. I buy donuts from time-to-time. If those donuts were free at the point of purchase, I would buy (and eat) a whole lot more than I do today. The stereotype of cops eating donuts came about because the donut shops gave them away to the cops for free. When I was working as a state-level lobbyist for the Blue Cross Blue Shield Association, I would attend meetings of the National Association of Insurance Commissioners (NAIC), the National Governors Association (NGA), the National Conference of State Legislators (NCSL) and a bunch of other organizations. These groups typically held their meetings in the ritziest hotel in Kansas City, New Orleans, San Diego, Boston or some other place that was easy to get to. Never, not once, did I ever inquire what the room would cost when I checked in. Why should I? Blue Cross was paying for it. The cost made no difference to me whatsoever. Some years later when I went into business for myself and tried to attend the same meetings at my own expense, I became very interested in the cost of the rooms. Most of the time, I would stay at a cheap motel on the edge of town and drive to the meetings. Information asymmetry (the providers know more than the patients). Of course, but that is also true of, say, criminal law or engineering. Health care is essential to life. But it is far less essential than food or housing, which do not require third-party payment. Patients are too fearful to make rational decisions. More fearful than if I were arrested and locked up at Riker’s Island? Health care is complicated. As complicated as an iPad? I don’t think so. Efforts to move away from fee-for-services or to control it never work very well. Witness capitation under managed care, or the RBRVS system of paying physicians under Medicare. Medicare’s system of price controls leads to absurd complexity yet does not reward physicians for the things that are most important to patients, such as kindness, patience, communication ability, friendliness – the qualities that humanize the medical transaction and that would be rewarded in any other segment of the economy not dominated by bloodless third-party payers. It is not fee-for-service that is the problem, but the burden third-party payers put on patients and providers alike, without adding any value whatsoever. When Will Dental and Medical Insurance be Integrated?